I've found that Germany isn't big into fast food in quite the same way as the States. I remember when I was little, if we had a busy day running errands, we'd often stop at Wendy's or Burger King for a quick bite. When I moved to Virginia, our choices switched to Chic-fil-a and Raising Cane's. And of course there was the ever ubiquitous McDonald's. It was easy: you simply drove down the highway or main road into town, and it seemed that there were at least five or six fast food options along the way. Not so in Germany. Sure, there are a couple of McDonald's locations on Konigstraße and one Burger King location. But if you want to find KFC, then you have to go out of your way. And Taco Bell? Only if you have access to one of the American military bases. Otherwise, that's it. And while I see lots of young kids at the McDonald's, fast food joints just really aren't a big deal here. So what do Germans do when they are hungry on the go? Well one option is a döner kebab. I've blogged about it before. They're cheap and delicious, and make for great drunk or hangover food. But what if you don't want a kebab? Then where do you go? To the bakery, of course. Just as fast food places are all over America, you can find a bakery (or two, or three) on just about every street corner here, from K&U to Stefansbäck, Backzeit, BackWerk, Kamps, and Lang. Plus, there's high demand for them. 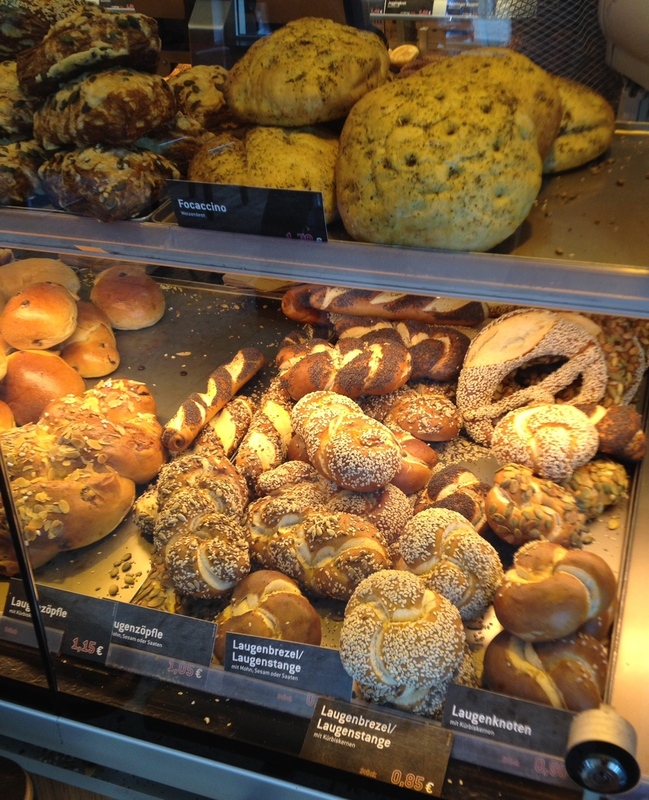 In the morning, people will walk in for their morning brötchen (bread roll) and coffee. At lunchtime, most bakeries offer an array of sandwiches. In the afternoon, you can stop by for your kaffee und kuchen (coffee and cake). After work, you'll probably want to pick up a loaf of bread to go with your dinner. Yesterday while I was on the go, I stopped by a bakery near the Rathaus u-bahn stop to pick up a quick bite between errands. I had a look at all the sandwiches, but in the end I decided to try my first ever Leberkäse im Brötchen. I have a German fried who's been saying I need to try one, at least once, while in Germany. I suppose I've waited so long because the name Leberkäse translates to "liver cheese" -- not the most appetizing name. It's a kind of meat loaf made with beef, pork, onions, and other meats and then baked in a bread pan. If the loaf has liver in it, then it's called Leberkäse, but if not then it's called Fleischkäse (meaning "meat cheese"). I've tried Fleischkäse before smothered in gravy and it's quite good. However, in general, giant blocks of pressed meat have never really much appealed to me (I think I've been traumatized by American Spam). What I got, however, was anything but Spam. The woman behind the counter picked up a fresh brötchen (what we would call a kaiser roll in the States), sliced it in half, and then went over to a warmer where she pulled out a huge hunk of warm meat in the shape of loaf of bread. I was apparently the first one to try that loaf, as she cut off a piece about an inch or so thick from the end. She asked me if I wanted ketchup oder senf (ketchup or mustard), but not knowing how it would taste, I decided to have my sandwich plain. I'm not sure what exactly I was expecting, but after my first bite I smiled as I realized that the meat tasted just like I was eating a hot dog; not like a German wurst, but like a real American hot dog. The meat has about the same consistency, soft but not rubbery, and the taste is somewhere along the same line. Leberkäse im Brötchen really is quintessential German fast food. The sandwich was filling and easily portable, and I was able to finish it by the time I reached my next destination. And at just 2€ a piece (about $2.60), the cost is pretty cheap. The only thing I wish I'd have done is gotten the sandwich with mustard. That seems like it would have been the German thing to do. Next time for sure.